Ask fellow campers about "Payne Oil RV Park" and nearby attractions. This is not an RV park or a campground. Perfect for one night stays. It's a large area that has some hookups. The owner lives over an hour away and never comes to the campground. The propane company across the street collects the $20.00 per night. It gets some maintenance attention about once a year. Some sites have 30 amp and some are 50 and 30 amp. Some have shared water. Some water hydrants do not work and some leak. All have sewer hookups. You'll need to just walk around until you find what you need. We were there when it was very cold, single digits. Three other trailers were there but they all had broken water pipes and the campers were frozen and unlivable. There are no picnic tables, fire pits etc. No showers, laundry or bathrooms. There is a large trash container. It is right off the highway so you will hear highway noise. We travel full time now and stay here when coming through this area since it was our hometown. Again, it's a great stop over for those on the road and needing a place just overnight. 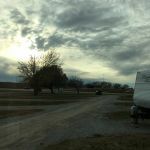 We camped at Payne Oil RV Park in a Fifth Wheel. There is a great coffee shop very nearby with bakery items and sandwiches. It called Mojo's and is right down the road on Bethel College campus. Basic day or three park. Right off I-135 next to Newton Golf Course. Everything worked, even a little shade in our site. Good value, will stay again if passing through. We camped at Payne Oil RV Park in a Motorhome. Check for this park on satellite view, we just marked it. Pull-throughs are 100'long. Good electric 118 VAC range. Excellent water, sound sewer. Narrow solid rock road and pads, so if it is wet and you cut corners be careful. Shared pedestal for water and electric, each pedestal has only one 30 amp and one 50 so try to pick one without a neighbor or call ahead for 50 availability, park is not that busy. Great for just an in and out park and only reason rated a 7. Pull in, pick spot, park then pay next door at Payne Oil. Owner is an oil and propane jobber and appears to have built his own RV park and RV storage lot PLUS a 9 hole golf course all on his property so bring your clubs. We camped at Payne Oil RV Park in a Motorhome. This is a very basic overnight park. No frills, no Wi-Fi, no cable TV, and you must share a water spigot with your neighbor. There is supposed to by a "Y" connector on the spigot so two can use it, but most of the sites were missing the "Y". We did find one that had it. The grass is mowed, and the sites are clean, and very level. This park is right next to Exit 34 off I-135, and the traffic can be loud at times, but it did not bother us in the least. It is an easy "off and on" park. We would stay here again if we were traveling through the area and needed a place to overnight again. We camped at Payne Oil RV Park in a Motorhome. Very basic site with good size level pull throughs. Close to the road so a little noisy and dusty, but ideal for an overnight stop. We camped at Payne Oil RV Park in a Fifth Wheel. Not a bad campground for a short stay. Sites were pretty level: rock with nice grassed areas. The ladies in the office were very nice. It's located close to the freeway with easy access. We camped at Payne Oil RV Park in a Motorhome. Great overnight stop. Easy on and off of I-70 We camped at Payne Oil RV Park in a Fifth Wheel. Are you affiliated with Payne Oil RV Park ?